what was intended to be a #gno on st. patty's day night turned into a date night for josh & i (hi, bae!) when the green budweisers came calling to my lady friends. (it happens, people.) so off we went to sunda in river north. i used to hold a grudge against billy dec after the bouncers at the underground wouldn't let me & my gals into da club at my bachelorette party (5 years ago). but when it comes to food, i can forgive & forget. my first visit to sunda was a couple years ago & it was obviously time to go back. sunda's executive chef, jess de guzman, is not only responsible for creating a separate, legit vegan menu at sunda, but he's also listed on chicago mag's 50 most beautiful chicagoans list from a few years back ... this is a guy who is winning at life, amirite? anyway, sunda's focus is "serving a modern approach on favorites from asia." simple, straightforward ... what more do you want? i'm normally more into the mediterranean preparation of shishitos, rather than the asian ... but this serving may have changed my mind completely. so delicious. i will say that the 1 in 10 rule for spicy peppers for shishitos did not apply here! sooo many spicy ones! but i'm a "bring on the heat" kind of gal, so i was cool. roasted sweet potato, asian pear, avocado, black garlic teriyaki & roasted red pepper puree. sometimes vegans miss out on the cool, fancy rolls that non-vegans get to eat. this one made up for that. so fancy! and BIG! i could not even come close to finishing this in addition to the other tasty items we shared. vegans also often miss out on eating sweet potato rolls, since they are usually tempura-ized & therefore, not vegan. so this was just all around good for me. tofu w/ rice noodles, carrots, cabbage, scallions & tamarind sauce. you know when you order from pad thai from any asian carry out place & you know ahead of time exactly what it's going to taste like? this was like but infinitely better. 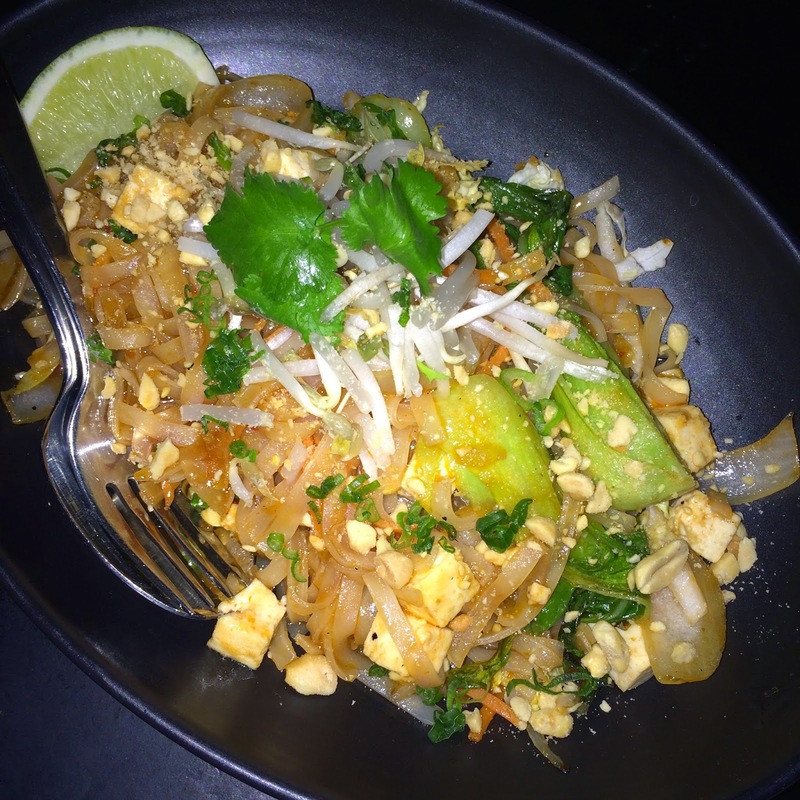 it had that same pad-thai-asian-comfort-food feel that you want from this dish, but elevated. i could eat it every day, for realz. listen. the food at sunda was great. and with a whole separate vegan menu, i know i'll be back. there was a lot of other stuff i wanted to try! my only complaint (& i really hate to do this) was that our server was absolutely terrible. not like issues with waiting too long or not checking in on us ... more like, he was just rude. literally, just rude. it's not something i come across often & we might be able to chalk it up to him having a bad day or something ... but it really put a bit of a damper on the whole thing. luckily, josh & i went to sprinkles after, so the evening was saved. Love all your reviews! Found your blog on Google a while back and check occasionally for ideas on where to eat. Quick question, why aren't sweet potato tempura rolls vegan? Is it something in tempura always? Thanks for all your fab reviews! yes ... there's usually egg in the tempura batter, unfortunately. you can always ask! but that's the general rule.